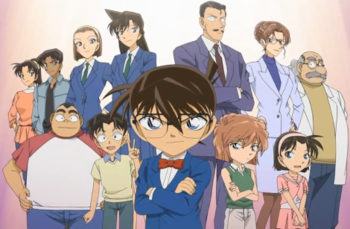 Scenario: Kogoro is invited to appear on Primetime Mystery hour at Nichi Uri studios. During a four minute break, the producer Miguel Santos is shot and killed. After the show ends, Miguel Santos is found by a cameramen. Conan suspects that Tate Evans, the Primetime Mystery host and decorated marksman, is the murderer but is unable to prove it as he would have had to run from the ninth floor to the fourth floor and back in four minutes which is impossible no matter how fast they run. Conan investigates and finds out that the storage room in the seventh floor, which took two minutes to walk to, has a window directly above the room where the murder occurred. Conan realizes how the murder was done. He lures Kogoro to the room and puts him to sleep. With his bow-tie, Conan reveals that Tate called Miguel telling him he would jump off the building. In doing so, Miguel looked outside his window and was shot in the head. Tate confesses to the murder and reveals that it had to be done in order to save the show from being canceled. 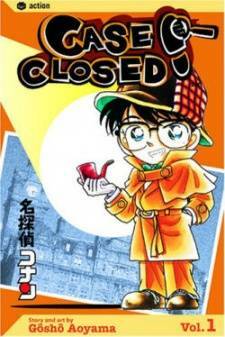 Afterwards Kogoro wakes up and suspects Conan is the cause of his sudden drowsiness during a case. Before he could pursue that ideal any further, the appearance of Yoko Okino causes him to forget about it.